The first street to come into existence in Cape Town was Sea Street, directly opposite Van Riebeeck’s Fort of Good Hope, along the beach to the west of the Heerengracht. This street is today situated far from the sea and runs past the Cape Town railway station. The well-to-do merchants of the seventeenth century had their large and tasteful houses here. Willem Adriaan van der Stel granted the land to a rich merchant, Reynier Smedinga, on which the Koopmans De Wet House stands. Tradition has it that Smedinga was a ship’s captain who brought out building materials on his last voyage and built himself a lovely thatched house on this erf in 1701. About the middle of the eighteenth century double-storied houses with flat roofs became fashionable. It was probably then that this house was given a second storey. At the end of the century Louis Thibault dominated the architectural scene. Along with the sculptor, Anton Anreith, they rebuilt the front of the house in the so-called Louis XVI style and gave it its present form. The beauty of the house lies in the strict classical lines of the facade and its harmonious proportions. The fluted columns, the panels between the upper and lower windows, and the pediment are the most striking features. The rooms are exceptionally large and the walls were finished in tinted plaster and decorated with conventionalised coloured representations of pilasters, mouldings and so on.The De Wet family acquired the house at the beginning of the nineteenth century. Eventually Johannes de Wet inherited the house from his mother (1794-1875). He was an advocate and played an important part in public life. Many important men visited 23 Strand Street during this period. Johannes de Wet was a collector of Cape furniture and of historical information about South Africa. Advocate de Wet had two daughters, one of them, Marie, married Johan Christoffel Koopmans who had come to South Africa after the Crimean War as an officer of the British-German legion. After the death of Mr. Koopmans in 1880 the two sisters occupied the house and it was then that Marie Koopmans de Wet came to the fore as a political figure. She not only added to the already valuable collection of furniture in the house, but also worked untiringly for the preservation of South African antiques and historical buildings. Indeed, it can be said that, acting on her own, she saved both the Castle in Cape Town and the Powder Magazine in Stellenbosch from being demolished. 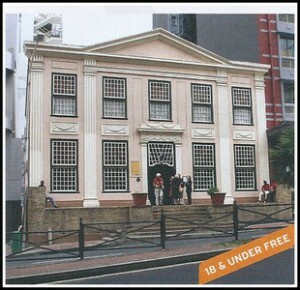 In the course of time her home became an influential salon, frequented by consuls, judges, ministers and members of parliament as, well as prominent personalities like Paul Kruger, Cecil John Rhodes, Sir John Truter and Presidents Brand, Reitz and Steyn, who came to exchange ideas about matters of public importance with their talented hostess.After the death of Mrs Koopman’s de Wet in 1906 and of her sister in 1911, the house and its valuable collection of antiques were in danger of being lost to the nation. By means of public contributions and government support the house with its most important contents was purchased and, on 29th October, 1913, handed over to the trustees of the South African Museum at Cape Town. Today a superb collection of Cape furniture, Chinese and Japanese ceramics, Dutch Delft, paintings, glass and silverware can be viewed.